Driscoll & Driscoll Insurance Agency has excellent insurance solutions for automotive service and repair businesses. We offer customized coverage including General Liability, Property, and Workers' Compensation insurance for small, independent garages as well as large franchised companies. Our agents will ensure you receive the right amount of coverage to protect your business with the most competitive rates in the industry if you qualify. Auto Detail and more . . .
At Driscoll & Driscoll, we aim to protect your business. Our auto garage insurance includes protection important to any business, with options that are important to any auto garage. Limits of $1 million per occurrence / $2 million aggregate are standard. Medical Payments for $5,000 per person. Damage to premises rented to you is included up to $300,000. Limit may be increased. Blanket Contractual for all insured contracts. Provides physical damage coverage to customers' vehicles as part of your repair/service operation. Business Personal Property - includes employees' tools and equipment, your diagnostic equipment while on premises. Products / completed operations coverage is included. Business income and extra expense - covers income that is lost due to suspended operations caused by damage at the described premises from a covered cause of loss. 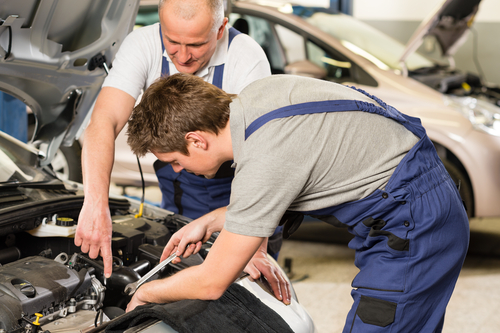 Like most auto garage owners, you probably consider your employees to be your most valuable asset. Protecting them and your business with the right Workers' Compensation insurance is critical. It helps to have Driscoll & Driscoll Insurance Agency working for you. We specialize is writing Workers' Compensation insurance for auto garages in California. We also work closely with our carriers to make sure losses are not over-reserved, which can have a negative impact when experience modifications are calculated. Driscoll & Driscoll's customers expect and receive the best rates and services to keep their auto garage moving in the right direction. Contact us today or request a quote for your auto garage insurance.